NOTE: Please see bottom of main page for submission info. Thank you. NOW IN OUR 15th YEAR! It seems Frank has been helping his shady neighbor Marc do drug deals, and by help, he was asked just to stand there for backing support. Not crazy about it, Frank goes along on several deals to be a good neighbor, until they run into a real crazy dealer named Wulfe, who is double crossed by Marc. 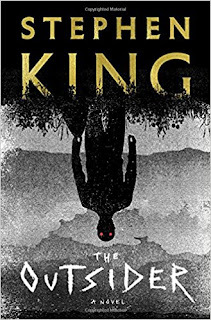 What follows is Strand at his gruesome best: hit men, freaks, off the wall situations, torture, horror, suspense, all wrapped up in some of the darkest humor you'll read this year (or any year for that matter). 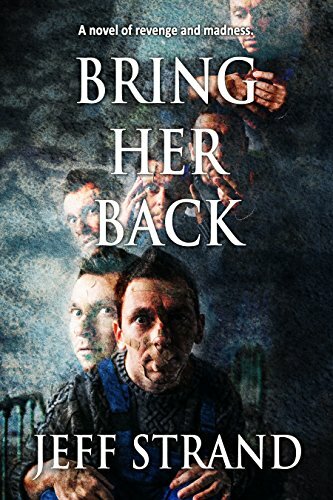 Told from Frank's point of view as he writes his crazy story (with a couple of surprises along the way), BRING HER BACK is another satisfying thriller from Strand, who continues to straddle the line between terror and comedy like no one else can. A great beach read that can be consumed in a sitting or two. Best disclaimer I’ve seen in ages; just reading that let me know I was in for a good time. I admire above all else in writing a sense of cleverness, creativity, and having fun. Happily, on all fronts, this collection of fourteen tales more than delivers. 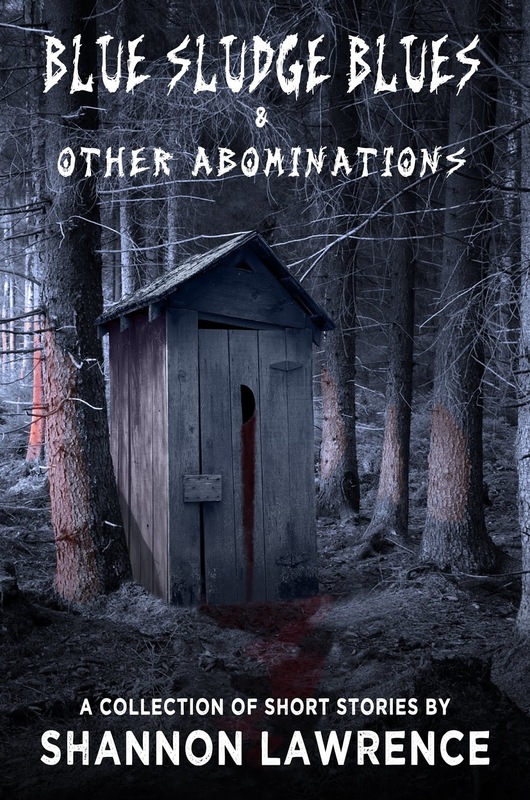 Subtle, spooky, evocative, and cool. “Maelstrom” is a first-person account of friends accidentally waking an evil. The suffocation factor of the opening scene of “Shifting Sands” is a breathtaker for sure. 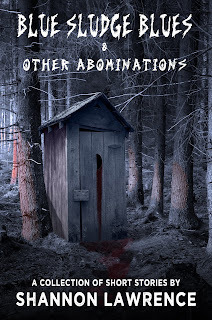 Port-a-potties are nasty at the best of times; after the visceral gut-wrenching ickiness of title tale “Blue Sludge Blues,” the prospect of ‘holding it’ a while longer will seem by far the wiser choice … or ‘holding it’ forever, kthx. “Cravings” is both grisly and, for the parents out there, kinda all too relatable. So is “Sound Advice” for those long night-drive road trips through strange country, and “In The Dark” for blind dates to the carnival. “Know Thy Neighbor” finishes things off strongly when a woman’s late-night routine leads to a deadly encounter. As a final aperitif, author notes add the optional (never optional for me; I love those!) insights into how each story came to be. Good stuff! Sean Walter is fairly new to my acquaintance, this collection my first introduction to his work, but I’ll say it now – he’s one to watch. 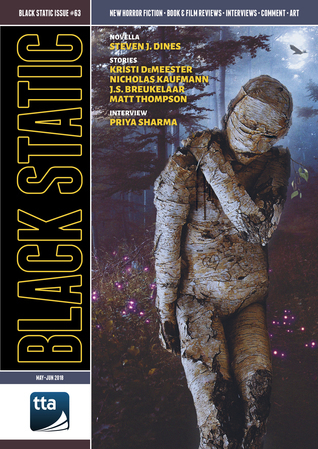 These stories are fresh and creepy, thoughtful, surprising. There are twenty-seven of them, but it’s not a thick book, so you’ll find a lot of quick page-or-two vignettes and shorter pieces that still manage to pack a big punch, lingering in the brain. Some start in the familiar, lending a sense of comfort and complacency, before stealthily whisking the rug out from under the world. Some are out-there from the get-go; ‘experimental’ is the word that comes to mind, experimental and different. “Writer’s Block,” for instance, about having nothing to write … and the contemplative advisory of “Roads Never Traveled” … musings on the meaning of love in “The Four-Letter Illusion” … they might not be ‘story’-stories, but they are powerful and resonant. So is “A Letter to a Friend,” which hits right in the feels, as they say. As does “Not my Proudest Moment;” I found myself doing the pained inward hiss of breath on that one. For the more ‘story’-stories, there are weird left turns, forks in the road and full-circle twists … journeys through memory and into imagination, across time and outside of time … travels of all sorts, around the world or between this world and the next … contemplations of reality and alternate realities. “An Evening’s Ride,” when four old partners gather again. “Etiquette,” which filled me with sorrow and fury. As a bonus, there’s also an excerpt from the upcoming novel MORIBUND, a small taste of the post-apocalypse I’m eager to read. 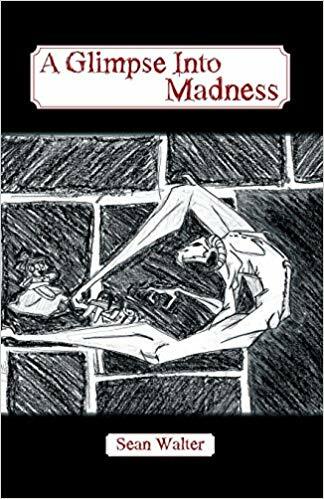 All in all, this book lives up to the promise of its title; you get many glimpses into many madnesses, and might recognize more than you’d want to admit. 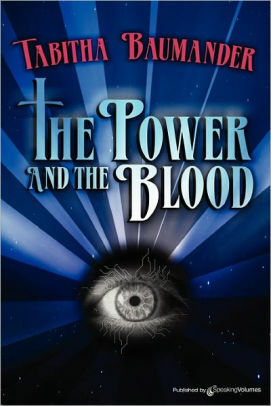 The author shows us with ease he’s got the skills to spin yet another dark and twisted tale, filled to the brim with legendary occult and supernatural goodness, brutal violence, and unique nightmarish twists and turns at every turn of the page. Not everything is as it seems and not everything always goes according to planned out here in the Mojave Wilds. Some secrets are best kept in the dark where they belong. Jess and her friends plot to kidnap a wealthy politician’s daughter to help come up with the money needed for a dire medical treatment. 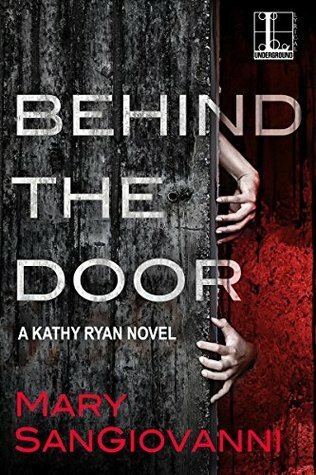 But, after her parents don’t care to pick up the phone to take the ransom call, the group of friends start to notice the mysterious girl they kidnapped may be hiding something much more sinister beneath her eight-year-old smile. How could her parents just abandon her like that? Don’t they care about her? The group of friends soon find the girl too calm and collected for having just been kidnapped by four strangers and she seems to know things about them. But, how? What are they going to do? They need to come up with a new plan and fast. 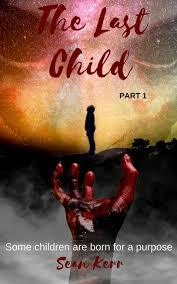 After the girl begins to take a liking to Jess, the mysterious little girl slowly begins to unravel her deep dark secrets, as members of the crew begin to drop one by one, all in hopes of ending the nightmare once and for all and setting out to find a better life. 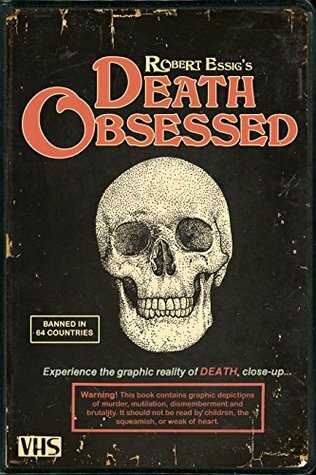 Opening with a nifty prologue, in which the Seven Deadly Sins personified show up to taunt a dying woman, then jumping ahead two thousand years, this biblical thriller follows an age-old secret society preparing for a prophesied confrontation between the Antichrist and a Merovingian descendant. Samuel is a misfit orphan, bullied at school, abused at home. His only solace is in his gift for art and inner conversations with ‘the Universe.’ Christina, one of his teachers, lost her parents in a fiery tragedy when she was young, admires his talent, and stands up for him even when it gets her in trouble with the headmistress. Little does Christina know her own long-destined part in what’s about to unfold. Even her best friend has been keeping secrets … not only from her, but in defiance of fellow conspirators. Around them, the state of the world is steadily worsening, with wars and other conflicts building toward a terrible conclusion. And something else is on the move, something no longer contented just with punishing bullies. Something vengeful and hideous from the darkest shadows, something with an avid taste for suffering and blood. 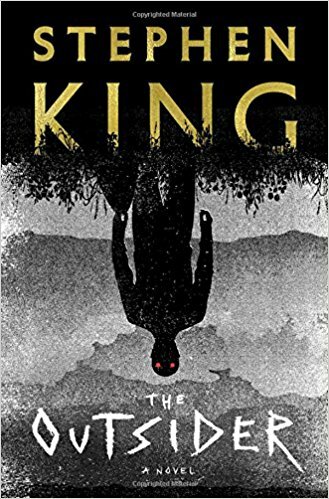 Decently written and entertaining, though ending on an abrupt to-be-continued cliffhanger, it’s The DaVinci Code meets The Omen. Claire Anderson is a fantasy writer finally hitting the big successes most can only dream of … the high-powered agent, the book deals, a speaking tour, paying off her mortgage. But all that in no way necessarily means she’s got it all together. She dithers around, she can’t garden, she hasn’t much of a social life. 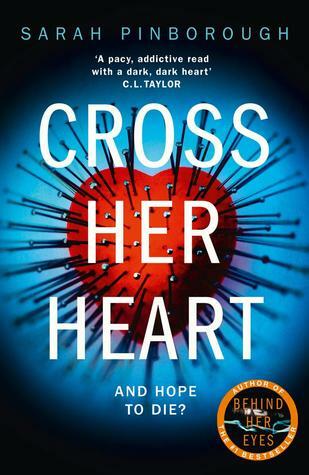 When, one night, a strange man goes walking down her street, Claire is quick to notice a few things. For one, he’s naked. For another, he’s a hottie. For a third, he’s got a distinctive unusual tattoo a place most people wouldn’t normally see. She approaches to ask if he needs help and notices something else: he’s behaving very oddly, like someone who’s just been through a trauma. And then he disappears. Not quite before her very eyes, but close enough, leaving behind a sooty outline on a brick wall. Of course, writerly curiosity compels her to investigate, but the more she does, the weirder it gets. Soon, she’s neck-deep in a case involving a cult trying to open a doorway to Heaven, a missing FBI agent, ties to an infamous military experiment, and murder. I saw an early copy that looked in pretty rough shape, so I’m hoping most of the editorial issues got sorted out before it went to print. My only other quibble is that there were a few too many convenient coincidences, seriously straining the suspension of disbelief. Otherwise, I found it a fun read, moving right along. I enjoyed the characters and the tones of self-awareness; they joke about writers solving mysteries, there are some literary snit-fits with academics, that sort of thing. The religious aspects aren’t heavy-handed, and the ending in particular has a satisfying cleverness. I’d certainly read more! 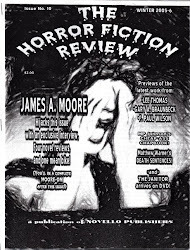 -First up in the fiction offerings is a fantastic novella by Steven J. Dines titled ‘The Harder It Gets The Softer We Sing,’ about a husband accepting he and his wife’s hereditary madness. 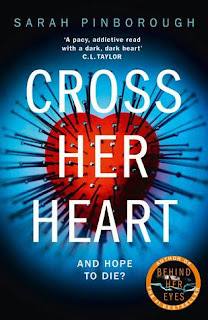 Simon, a writer, is haunted by dreams of spending time with Bukowski and Bradbury while his wife Sue is convinced she never miscarried and is indeed pregnant with their second child. Their son has major mental issues, and they come to grips with everything in an unforgettable scene at a children’s park as onlookers gawk. Unlike the recent spat of dysfunctional family horror films, this won’t lull you to sleep and offers an emotional gut punch. -In ‘Raining Street’ by J.S. Breukelaar, a trip to the market leads to a strange encounter in this unsettling ghost (or is it?) tale full of wonderfully strange people and a dream-like aura. Breukelaar’s attention to detail makes this one a pleasure to sift through. 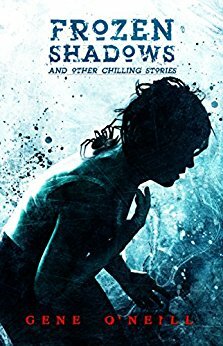 -‘Pyralidae,’ by Kristi DeMeester reminded me of an old EC horror comic, albeit with DeMeester’s always top notch writing. Josephine inherits her late father’s orange grove and begins having nightmares about something living in the basement. Her dream becomes real and acts more like a guide as would-be boyfriend Alex arrives just in time for planting season. 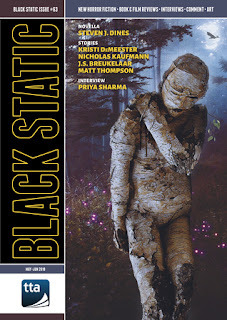 -Finally, Nicholas Kaufman’s ‘The Fire and The Stag’ follows Kenneth as he searches the forest for his missing sister April, who has always taken care of him after their parents died in a fire when they were kids. 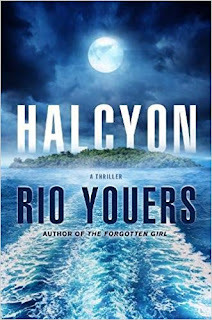 April, an anthropologist, is trying to prove a lost tribe actually existed, but what she (and Kenneth) find brings them back to the night they lost their parents. A gripping, melancholy study of sibling love. It can't be understated just how good the fiction is in every issue. Writers who aren't familiar with this magazine would do well to take note. 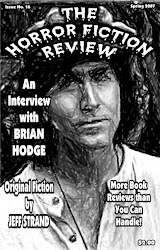 Peter Tennant interviews Priya Sharma and reviews her debut collection ‘All the Fabulous Beasts,’ then he looks at three titles by John Llewelyn Robert, the best of which seems to be his latest collection ‘Made for the Dark.’ There are also four more in-depth novel reviews that’ll have most readers making a shopping list (next issue will be Peter’s last column, and I’m already missing him). 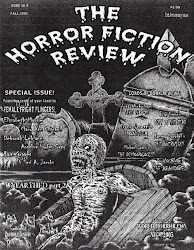 THE HORROR FICTION REVIEW began in 2003 as an old-school fanzine, generally a 14-20 paged, stapled-Xerox publication featuring reviews of horror novels, occasional film reviews, and author interviews. 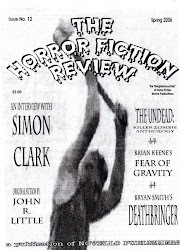 In 2008--mainly due to skyrocketing printing costs--the fanzine became the e-zine you're now looking at. 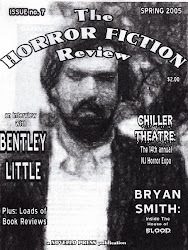 THE HORROR FICTION REVIEW offers reviews FOR fans of horror fiction, BY fans of horror fiction. We rarely print super-negative reviews unless we feel a book truly deserves it (our biggest criticism is that we "like everything we read." This is the furthest thing from the truth. 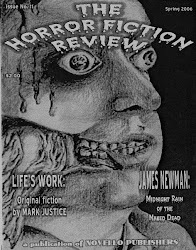 MANY books we read for review DO NOT make it into this e-zine). We've also been labeled a bunch of "fanboys" who write "fanboy reviews." Well, DUH. 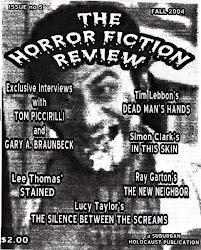 This is a FANZINE. 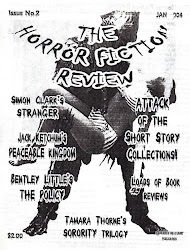 If you want more critical reviews, a FANzine might not be the best place to look. 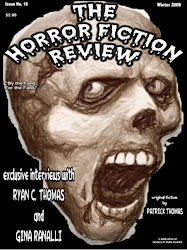 THE HORROR FICTION REVIEW has been overwhelmed with submission material so please be patient. 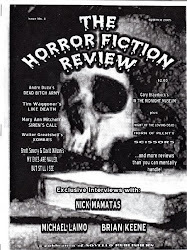 Our main reviewer, Christine Morgan, is currently accepting review material. Contact her through all your favorite social media sites. This note updated March 24, 2019.